Ride 200 miles in one day through Yolo, Napa, and Lake counties on the most popular and one of the best supported double centuries in California. Always the 3rd Saturday in May. THERE ARE OPTIONAL 100 MILE AND 45 MILE RIDES. These shorter rides have the same Start/Finish as the Double but are separate rides and not a short cut for the Double. The Davis Double is the most popular double century in California. It is considered an ideal first double century. There is no “death”, “terrible”, “monster”, “devil”, or “heartbreak” in this ride. What really sets the Davis Double apart from other rides, for first-timers as well as more experienced long-distance riders, is the level of support we give our riders. There are nine rest stops in addition to a lunch stop, and multiple SAG vehicles patrol the entire course. As for difficulty, there is about 8,400 feet of climbing with a few longer climbs. Nearly all of the climbing is under 10%, primarily in the 6-8% range, and the climbing ends well before Mile 150. There is also a four-mile section of hard-pack dirt road around Mile 100 in Big Canyon. The hard-pack section of the ride is a gradual climb with a few gentle rollers. We hold the ride every year on the third Saturday in May. Registration opens on March 1st. 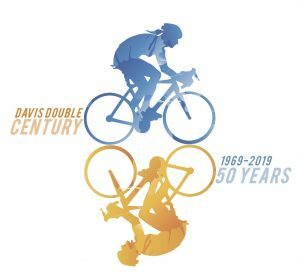 The 50th Davis Double Century will be held on Saturday, May 18, 2019. Registration opens on March 1, 2019. We will post details here as the registration date approaches. If you have any questions before then, and cannot find the answer in the links below please contact us. The ride starts at the original location, the Davis Veterans Memorial Center on 14th Street and “B” Street in Davis. After leaving town, the first part of the ride runs through flat farmland in the Central Valley toward Esparto. The route then turns south to Winters before climbing over the Berryessa Gap and running north through the hills in east Napa County to Middletown and Lower Lake in Lake County for lunch. After a long climb up to Resurrection at the Lake/Yolo county border, the road descends through Cache Creek Canyon and Capay Valley back to the Central Valley farmland and the finish at the Davis Senior Center in Davis. You can see an overview of the course here. All Double Century riders must be on the course by 5:15 am Saturday. The ride closes at 1:00 am Sunday. Riders doing the 100 miles or 50 miles can start as late as noon. Starting by 8 am is recommended for the century riders. These shorter rides use portions of the Double Century Route but at different times than the DC riders. The 2019 Route Description for each of the three rides will be posted before May 1, 2019 and will be Garmin loadable. Once you leave Davis the 200 mile and 45 mile routes will be essentially the same as 2017’s routes. The 100 mile route is new for 2019. REGISTRATION OPENS MARCH 1, 2019.